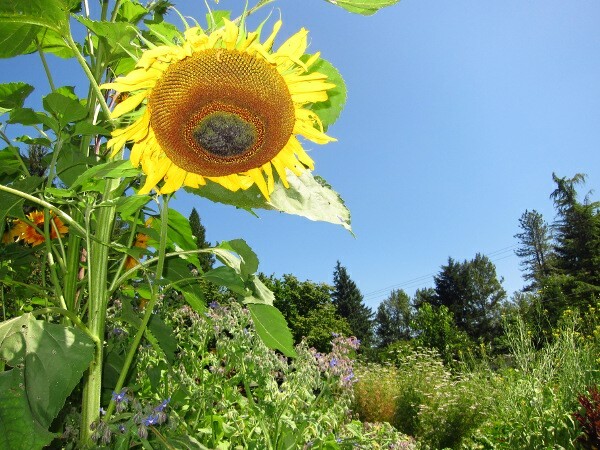 Our veggie garden this year has an abundance of volunteer sunflowers. 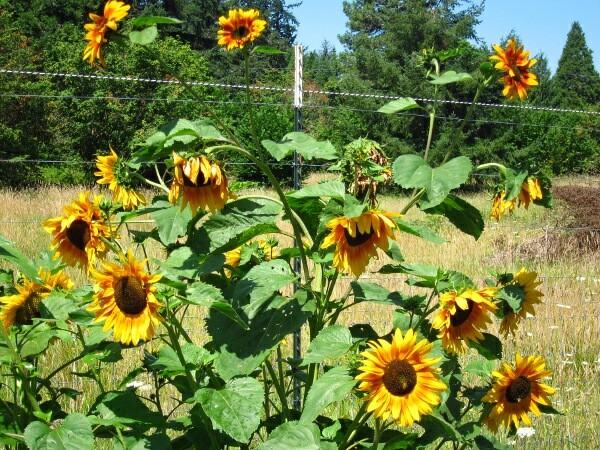 Last fall I left the sunflower stalks until the wild birds had cleaned up all the seeds. I’ve never had volunteer sunflowers before, so I guess the birds planted them for me. 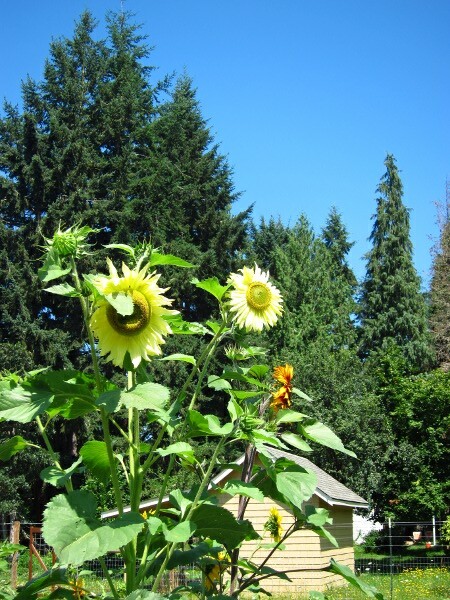 Most of the sunflower plants were weeded out, but I transplanted the healthier ones around the garden. Some of the volunteer plants have been blooming since the beginning of July. They seem to have many more branching arms than the original varieties. Last year I posted my first sunflower picture at the end of August and they were still blooming at the end of September. Letting the sunflowers seed themselves seems to have given me a jump on enjoying the flowers. Some of the stalks are bigger than your wrist and others have grown very tall. Besides the wild sprouting sunflowers I also planted a whole 30′ bed of different varieties at the edge of the garden. These plants were supposed to be a trap crop for the cucumber beetles. I think I may have planted them a little late though. The first plants in this bed just now blooming. 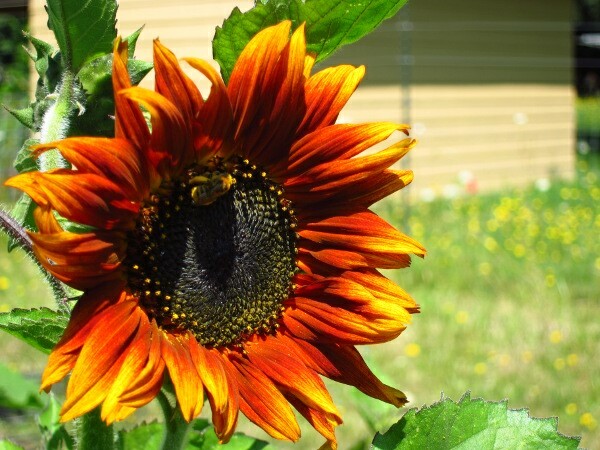 Sunflowers are a favorite of mine. You have to smile when you see them. That might be why Robin plants them. We have so many of them this year! Nice pictures – It’s great when they come up from seed the next year, especially when you plant different types the following year. Yes, I was happy to see the lemon colored one was back. 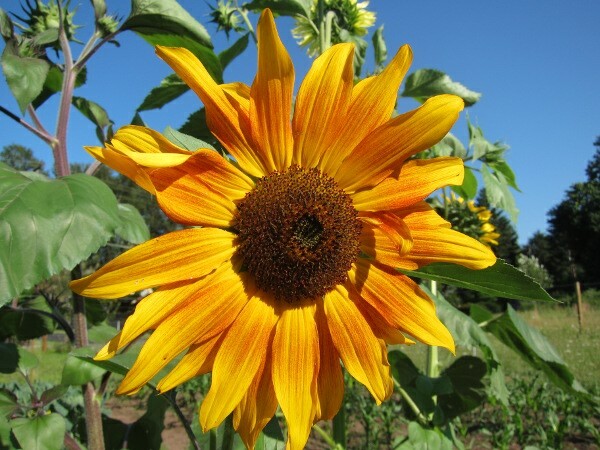 It’s so atypical for sunflowers. Wow! My best crops are volunteers. I’ve eaten volunteer potatoes every night since Peggy has been gone. We have a lot of potato volunteers in our compost pile. If I didn’t have so many of them planted already, I would dig up the compost pile to see what we have. 🙂 Lee is letting some tomato plants come up from last years seed in the garden. He is interested in seeing what they produce. I have been wondering if I could plant some potatoes and Jerusalem artichokes in the late fall before the ground got too wet to work letting them think they were volunteering. Any thoughts? I am 40 miles North of Portland. I have no experience with Jerusalem artichokes (yet), but I think this might work for potatoes. We have volunteer potatoes every year in any area which grew potatoes in the last several years of rotations. 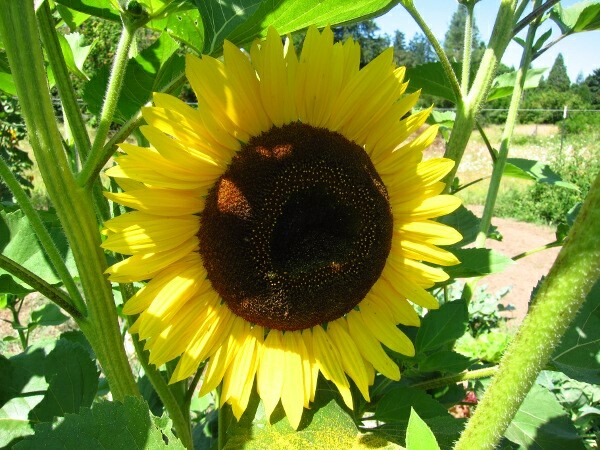 Some of them start far sooner in the season than we are willing to actually plant our main crop (much like the volunteer sunflowers in this post). The down side of this is that potatoes are susceptible to frost. You would have to provide some kind of cover on any nights that dropped down near freezing. There’s a tradition to plant at least one potato on St. Patrick’s Day (March 17th), but where we live in mid-Oregon such early potatoes don’t usually survive without help.